This review is about 8 printed pages long. It is copyright © Jack Cox and Jacket magazine 2009. Ron Padgett has written his recherche du temps perdu. Throughout this specular book he loses again what has been lost, waits for what has come and because most poetry saves nothing but time, is perfect timing. A basic rhythm, true to the moment of writing, appears to be one of holding and releasing. The poems are connected across gaps but the head comes away from the body more than once, and the attack of the collection — ‘Mortal Combat’ — sees the author trying to stop the idea of an English muffin from descending further than his salivary glands to his fingers, perhaps, where it is too late, and from ‘trying to pull me away from who I am. I am / a squinty old fool stooped over / his keyboard having an anxiety attack over an English muffin!’ Probably the unwelcome idea wants to pull him away to the fridge of another poem where Frosty ‘is stuck and so am I.’ So an end to the unstoppable flow of material is a block but iamb iamb is the purest and most brilliant, the complete identity of poet and poem in strife. It occurs once more at the end of another line. Later the author experiences a ‘fantasy block’ over a young girl in the gym but when you close the book, in the dark this poem secretly presses against another in which his old lover and he coo at each other in ‘the soft warmth of candlelight.’ These poems are communications from ‘between breaths’ as John Ashbery wrote once. Stopping and starting on the way to nowhere, their paratactic metronome swings back and forth through life. ‘Tops’ is a fourteen-line poem in which the first of the lines quoted above falls on the turn in an Italian sonnet. Like iamb iamb, the joke is typical of a poet who has been ‘young enough to kill myself for art’, and has probably lived for it. It shows up less as a poise he has maintained between idiosyncrasy and high technique as a marvelously helpless symbiosis of one and the other. Ron Padgett still likes not to look up in a reference book the Swiss Family Robinson whose name confused him when he was young. Elsewhere he has written about his childhood taste for repeating a word until it separated from its meaning and started to sound like anything else. Here in ‘Rialto’ he remembers the theatre of that name in his hometown. Only later, he writes, would he learn about the bridge, and how things can ‘start all over / as a perfectly clean phoneme in the heads // of the innocent and the open’. (There was a Rialto theatre in Sydney that disappeared in the thirties, in time to start over in Tulsa.) You are made to think of ‘Rinso’ a few pages back, a soap ad dream vision of his own infancy perhaps, a new birth that makes things ‘sparkling’. wish to remain a phony the rest of my life. Instead, the level of play intrinsic to all reading and writing is recovered along with a cleanness of sign and sound from a kind of back-to-basics memory of childhood. Perhaps the phoneme hidden in ‘phony’ is the secret content of that wish, an hiatus to meaning that has a graphic counterpart in those candles sticking up on their stanzaic cake. I I I (take a breath) wish… In this kind of family history anything is possible. ‘Roy wasn’t really my uncle’, he writes. It does not matter, he could be yoR uncle. Spin it how you like. So much for forefathers. The author says he plans to finish reading the Commedia but when he wants to talk about Dante his involuntary memory interrupts, once with the comedian Shecky Greene, another time with Jimmy Durante. But he does remember Dante and his canonical followers when he is not talking about him. A poem about Geoffrey Chaucer tells us that everyone in his day moved in stop action, ‘so they could be shot into a tapestry.’ In the flame-bordered poem that follows, called ‘The Question Bus’, the shutter is a shuttle again when the speaker considers where someone’s friend is going to fall: ‘Somewhere in between a rock and a click, where the abstractions / roam about in their ghostly attire. They are haunting our / thoughts, we who wear human attire.’ The collection mimics the trains of unconscious memory, and here in the last words is a darkly burning memory of the Inferno slipped in as easy as Jimmy Durante (that happens to come from the first bit of it I ever read and that too was in someone else’s poem, whence it went through me in a fork of lightning to linger like an unanswered question until a year or so later I read what I recognised to be the original and learned about the ghost of great art. Hello, old friend, so this is where you’ve landed lately). Sometimes it is his own work that is cycling back; he even repeats an old piece of advice (‘wash the dishes’). Saint Augustine wrote that memory is ‘the belly of the mind’. Once Ron Padgett wrote: ‘there is indeed money in the tummy’; now someone has spent his ‘fifteen units of beauty’ too fast and may be on his way back to the bank when he runs into Augustine. Sometimes it is someone else. Who is in the wind ‘coming up the lane and into the window / to enlarge you to sky size not / for the sake of your so-called immortality / but so you can growl even louder / in the sleep that has become both yours and ours’ if not Frank O’Hara, who could have said the part about ‘so-called immortality’ and who once appeared in a poem Ron Padgett wrote in which his eye was the window in a building that was O’Hara (window comes from the Old Norse for wind-eye). He also wrote: ‘The wind that went through the head left it plural’. are hastening home for dinner. (The book is an afterlife for his mother but is dedicated to his grandson and his grandson’s parents.) The poems swing between two worlds for which they have no words. Flowers on a grave spell ‘Mum’. Sometimes instead of ghosts there are animals or things who also “escape” the poems and in doing so leave something ‘hidden’ in them, a ‘secret’ without a voice. A nail, for example, ‘buried in the wood, / with no lips / to tell the tale’, of whom you are reminded later by the stapler left behind by his mother, now ‘floating’ in a poem preceded by the lines, ‘Would you tell me / your secret then?’ As incommunicado as Frosty the Snowman is a squid, a secret author who ‘hastens to flee your liquid writing’. The squid poem is really wonderful. It seems to have been touched by Marianne Moore (as have a couple of other places in the volume) not only in the bookish animal who escapes the writing as the writing runs into it (you follow two colons into the insides of the squid but end up outside) but in the idea that the squid is an impossibility itself, since what you will ‘never have’ from it are its own ‘dark and human tales’. So it is that the surface of the poem is full of hidden trains and visible trains, a ‘face’ he lets ‘carry all kinds of packages / back and forth from my brain to the world’, and where you can be alone with all the things that are not there, being there but not elsewhere. Which is why it is so awful! ‘The emptiness of the room was worse / Than the emptiness of the universe’. Sometimes, as in ‘The Absolutely Huge and Incredible Injustice of the World’, the poems can hit perfect pitch on this, but it is not always successful. ‘Straighten up your room / before you save the world’ is good advice to a poet, not to mention to someone just in a room, but there is something off about the hokey but, on its own, honest qualifier: ‘Then save the world.’ Is it because it is the one bit of useless advice in a poem otherwise full of useful advice? Likewise, when he equivocates in the toothbrush poem between being ‘insufficiently angry’ and ‘too angry’, it feels like an uncharacteristic moment of bad faith. Though all over this aspect was also one of the nicest new turns in the book, and is mostly funny, beautiful and wise. When you chase the tricks what can sometimes escape is the grace of the artist. That can be helped but no longer by me. One reason this review is inadequate is that its subject is a masterpiece and masterpieces give you a hell of a time. Ashbery, John. Collected Poems 1956-1987. New York: Library of America, 2008. Augustine. The Confessions. In Basic Writings of Saint Augustine. Ed. and trans. W. J. Oates. Vol. 1. New York: Random House, 1958. 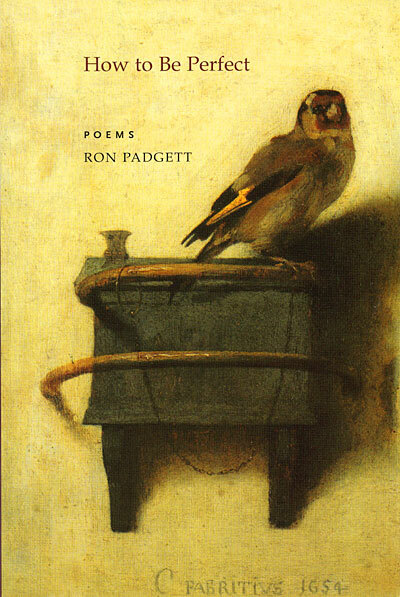 Padgett, Ron. New and Selected Poems. Boston: David R. Godine, 1995. ———. Great Balls of Fire. Minneapolis: Coffee House Press, 1990. ———. Blood Work: Selected Prose. Flint, Michigan: Bamberger Books, 1993. Ashbery, ‘And Ut Pictura Poesis Is Her Name’, Collected Poems 1956-1987 (New York: Library of America, 2008), 27, 520. 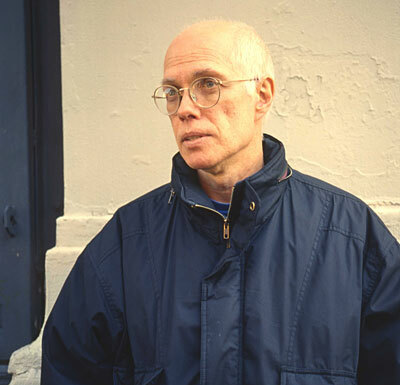 See Ron Padgett, ‘Foreign Language’, Blood Work: Selected Prose (Flint, Michigan: Bamberger Books, 1993), 4. Padgett, ‘Voice’, New and Selected Poems (Boston: David R. Godine, 1995), 20-21, 85. Augustine, The Confessions, in Basic Writings of Saint Augustine, ed. and trans. W. J. Oates, Vol. 1 (New York: Random House, 1958), Book X, Chapter XIV, 157. Padgett, ‘Tone Arm’, Great Balls of Fire (Minneapolis: Coffee House Press, 1990), 181, 69. Padgett, ‘Reading Reverdy’, Great Balls, 1-2, 87. 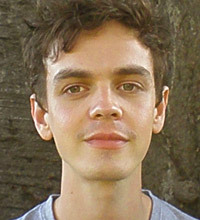 Jack Cox finished a Bachelor of Arts at the University of Sydney in 2008. He lives in Sydney.